Superbook DVD Club - The new concept in kids discipleship. 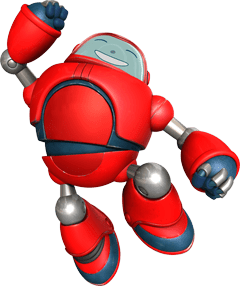 Superbook is an animation series that teaches children timeless moral truths and life lessons through the captivating, Bible-based adventures of two time-travelling children and their robot friend. Train up a child in the way they should go, and when they are old they will not depart from it. Keeping children engaged is key to teaching them the Bible. With state-of-the-art animation, Superbook is imparting truth to viewers of all ages. With a new DVD arriving in the mail every month. Your kids will be continually immersed in the Scriptures, changing lives for the better. Every episode is matched to the story told in the Bible, even down to the Bible character dialogue, which comes directly from the Scriptures. Each month (around the 7th) a brand new episode or an exclusive Explorer DVD is released to club members only. When your pack is ready to ship, your card will be charged $25. When you see the impact on your children’s lives, you’ll want to share. Two extra DVDS are in every pack to give away. Introduce kids to Superbook – introduce kids to Jesus. 2 giveaway DVDs included in each pack. We all love free stuff! Ocassionally your kids will receive free Superbook give-aways. Superbook provides you and your children an easy way to reach the younger generation with the Gospel. If you’re not completely satisfied with your purchase we will refund you subject to these terms. No lock in contracts, or long term commitments, cancel anytime. Newly created episodes are released to club members, before they can be individually purchased. You will have the episodes well before anyone else! Your support will help continue to reach children with the Gospel, through new episodes and translations into other languages. What value would you place on knowing your children are growing in God’s Word regularly? If you have subscribed to the DVD club before, please enter your details in the boxes below. If you are a new customer, please proceed to the Billing & Shipping section. Superbook is a DVD series that teaches children timeless moral truths and life lessons through the captivating, Bible-based adventures of two time-traveling children and their robot friend. When you join the Superbook DVD Club you’ll be charged for your first Superbook episode at the published introductory price. Your second episode $25 charge will occur on the next release date, usually around the 7th of each month and monthly thereafter. At the moment your only option is to pay by Credit or Debit Card. Visa, Mastercard or Amex are accepted. How much does the club cost? The Superbook DVD Club costs $25 per month. You can contact us here……. or by phoning us on 1800 005011 from Australia or from New Zealand on 0800 005011 Its a freecall and we are here QLD office hours. Can I have the DVDs shipped to another address? Yes. When you join the club you have the option to enter two different addresses. There is a place to enter the address you want the monthly pack shipped to. That way it can go directly to your friends or grandchildren anywhere in New Zealand & Australia. Are my details and payments secure? Absolutely. All your information is processed through our trusted and secure website. Anytime you see this padlock and a site name starts with an HTTPS:// that says it is secure. Where does Superbook come from? Research performed during and after the outreach showed that this series was an unprecedented success. Over 8 million people a night watched Superbook on Japanese prime-time television, and the Bible became the nation’s best-selling book. By 1989, in the midst of economic and political turmoil, Superbook began broadcasting in the Soviet Union with astounding results. When Superbook aired during prime-time on the Soviet National Channel, CBN received over 6 million letters from children, introducing an entire generation to the Bible. From Japan and Russia, the original Superbook series went on to air around the world. More than 500 million people watched the series, 52 episodes were translated in 43 languages and broadcast in 106 countries. Today, CBN and a team of Emmy-winning artists and storytellers, whose credits include Mulan, The Lion King, and Beauty and the Beast, are collaborating to completely reimagine the classic series using the latest 3D CGI technology. Our goal is that the new Superbook will honor the life-changing legacy of the classic series and re-introduce it to a new generation. What is the vision for Superbook? “It’s time to reimagine the original Superbook series, to take advantage of it’s legacy and introduce it to a whole new generation. The success of the original Superbook came from the Bible stories. The stories of the Bible are true, they really happened and they are very powerful. The success of the new Superbook series will come from relating these spiritual truths and maintaining Biblical accuracy. Can I cancel or am I locked in? Who is Vision Christian Store? Vision Christian Store is the resource arm of Vision Christian Media. Providing trusted Christian resources for the whole family, Vision Christian Store carries a range of books, movies, audio CDs and DVDs for Bible study and practical understanding of life through the lens of the Bible. What are the 2 DVDs in the cardboard wallets for? In your Club Pack you will 3 DVDs of each episode. One is in a regular DVD case – this is yours to keep. The other 2 DVDs are packaged in cardboard sleeves and are designed to be used as gifts, prizes or outreach tools. They are easy to post – great to pop in a birthday or Christmas card! Keep them in your bag or car so they are handy to give when the time arises. We’d love to hear your stories of children and families coming to Christ through these mighty cartoons! Can I screen Superbook publically? Yes, but you may require a license. Click here to find out more about this and when you will need to request a license for public screening.